ItemBARK_1990.0003.1052 - The Hoy Family. Back row, left to right: Lona, Yvonne, May, Avaline, Anne, Rose, Star and Lily. 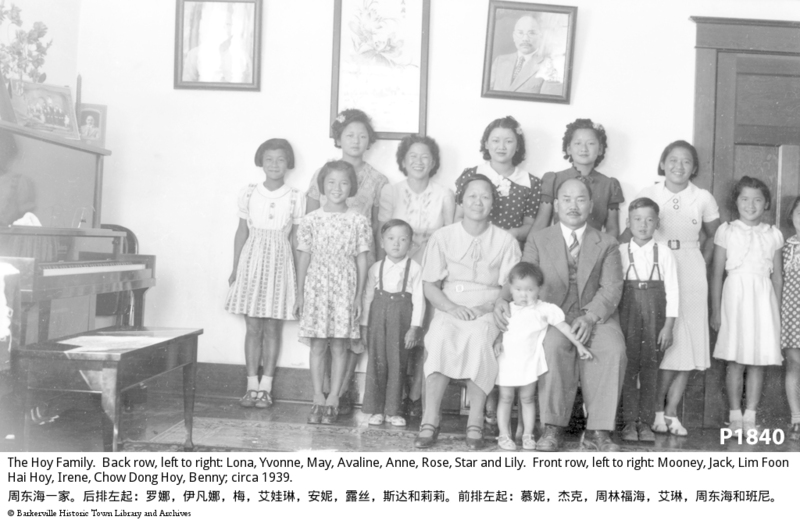 Front row, left to right: Mooney, Jack, Lim Foon Hai Hoy, Irene, Chow Dong Hoy, Benny; circa 1939. Item BARK_1990.0003.1052 - The Hoy Family. Back row, left to right: Lona, Yvonne, May, Avaline, Anne, Rose, Star and Lily. Front row, left to right: Mooney, Jack, Lim Foon Hai Hoy, Irene, Chow Dong Hoy, Benny; circa 1939. The Hoy Family in their front room of their house in Quesnel. This image depicts 1 man and woman (sitting), 10 girls, 2 boys standing in a living room type area. There is an upright piano to one side of the group and 2 framed photographs and a long vertical (framed) piece of art work between them, on the wall, behind the group. Hoy & family portrait.